Donald G. Sandt, Jr. 72, of Nazareth, died Friday, January 21, 2011 at Moravian Hall Square after a courageous battle with kindey cancer. Born: August 11, 1938 in Easton, he was the son of the late Donald G. Sr. and mildred Glover Sandt. Personal: He and his wife, the former Harriett Butz, have been married for 45 years. 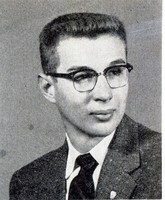 A 1956 graduate of Easton High School, he was editor of the Junto, the high school newspaper; junior class president; and received the Easton Exchange Club award for outstanding senior. He attended Franklin and Marshall College and graduated from the University of Miami. He served two years in the Army at Walter Reed Hospital. He did research work at Case Western Reserve, Solomons Island, MD and two and one-half years st St. Lucia with the Rockefeller Foundation. Before his retirement, he followed his father as the owner of Sandt Printing Company, Inc., in Palmer Township and was proud that his son, Frederick, tgook over the business. Donald loved his trips to New York City, his season tickets to the Metropolitan Opera, and discoverian new restaurants. He enjoyed vacationing in St. Maasten, fly fishing, art and Springer Spaniels. Survivors: in addition to his wife, Harriett; a son Frederick and his wife Dawn of Bethlehem Township; and his beloved grandson Gavin. Services: Will be private. The Ashton Funeral Home, 14th and Northampton Streets, Easton is in charge of arrangements.